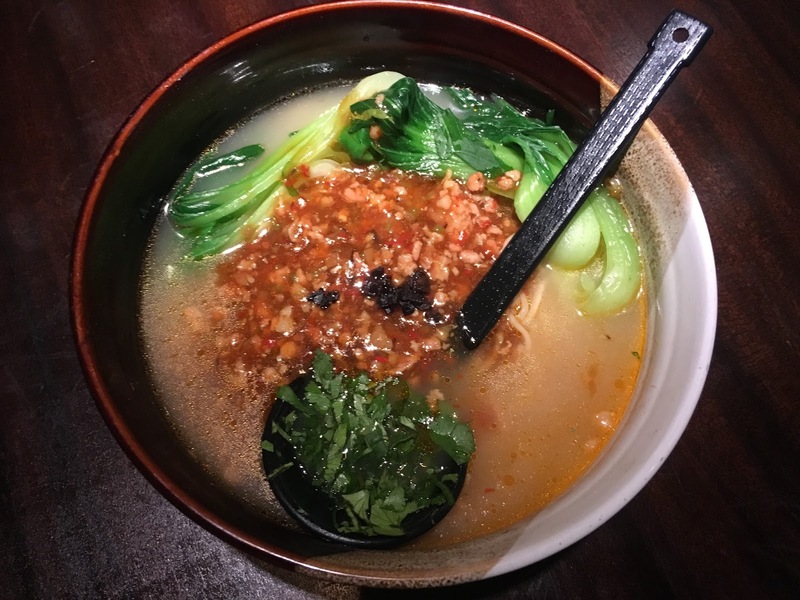 The first U.S.location of Imperial Lamian, based in Indonesia, is now open to the public in the heart of River North. Imperial Lamian features authentic and modern Chinese cuisine with dishes prepared by three Master Chefs. 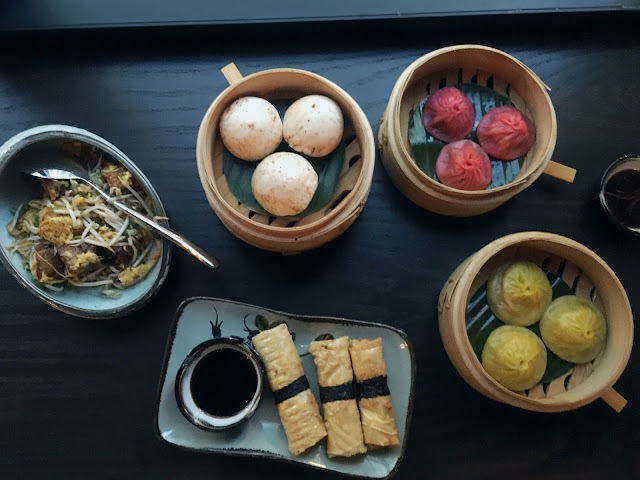 That's right, there are three chefs trained in their individual crafts: Chef Kok Lam Andy Foo creates wok dishes, Chef Lim Kee Tiong specializes in dim sum and xiao long bao (soup dumplings), and Chef Wang Hongjun focuses on fresh, hand-pulled lamian noodles. 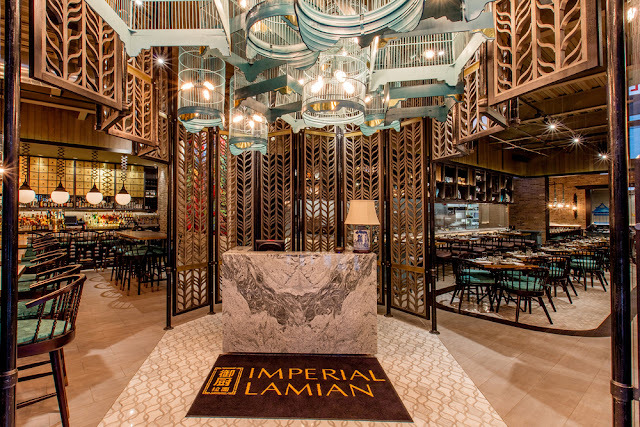 Imperial Lamian features design by Indonesia-based Metaphor Interior Architecture and showcases raw timber and exposed materials in earthy tones of green, light and dark browns, highlighted with stone mosaic tiles throughout. One of my favorite features of the space are the light fixtures, including bird cage lighting above the restaurant's host stand. All of these were fantastic, but the real star were the steamed soup dumplings which are served three to an order. This was our first time enjoying soup dumplings and luckily they arrived with directions from our server. You place a dumpling in a soup spoon, poke it open with a chopstick, pour the soup into the spoon, slurp the soup, then eat the dumpling. It really sounds more complicated than it is. The Gruyere dumpling was melted cheese heaven, while the spicy Szechuan had the perfect kick. The thin dumpling really allows you to take in all of the flavor of the fillings. The mushroom bun (shaped in a mushroom), was slightly sweet and very aromatic with truffle oil and cinnamon sprinkled on top. 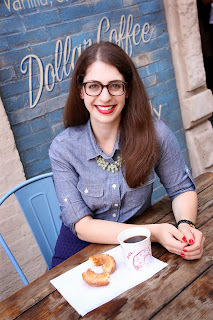 I would come back for dim sum alone! Our next course was their namesake la mian. La mian are hand-pulled noodles made to order and served in broth with various toppings. 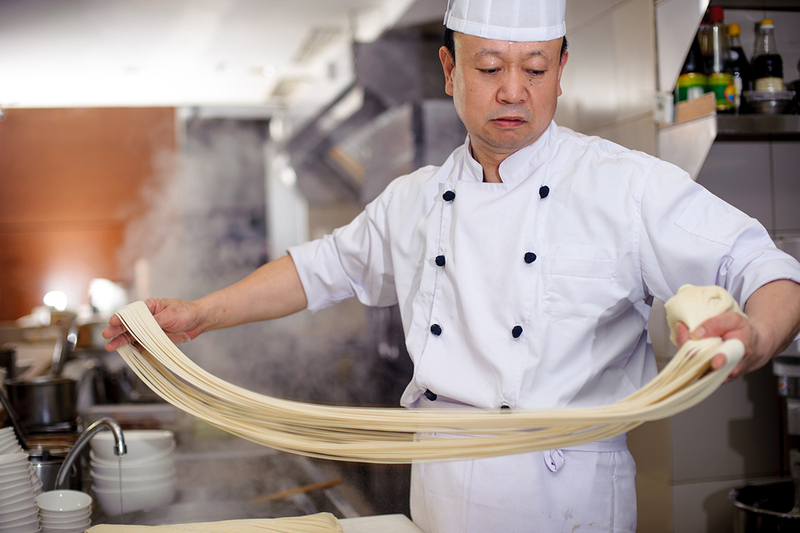 The open kitchen allows you to see the chef hand pulling the noodles and dropping them directly into boiling water. Think ramen, but WAY better. Imperial Lamian claims la mian is the new ramen, and I don't disagree. We ordered the minced pork la mian with a spicy pork broth, black garlic, truffle oil, and shiitake and wood ear mushrooms. The broth was not heavy but was wonderfully seasoned, and the minced pork was plentiful. The best part was the noodles. The texture is springy, doughy, and simply carb heaven. Under the pork menu section, we tried the jasmine tea smoked ribs which are wok smoked with jasmine and BBQ sauce. I'm not kidding you when I say these ribs fell right off the bone. While I didn't pick up hints of jasmine, I was impressed with the quality of the meat. One of the most famous Chinese dishes is 3 cups chicken, which I actually hadn't tried before. This was the perfect excuse to give it a shot. The dish gets its name from the 3 sauces used in its preparation. Their version featured braised chicken thigh with sesame oil, dark soy sauce, shaoxing (rice wine), Thai basil, and red peppers. The meat was uber tender and the sauce very flavorful. This dish was definitely a hit at our table. Under the fried rice section of the menu, there are four varieties with different proteins. 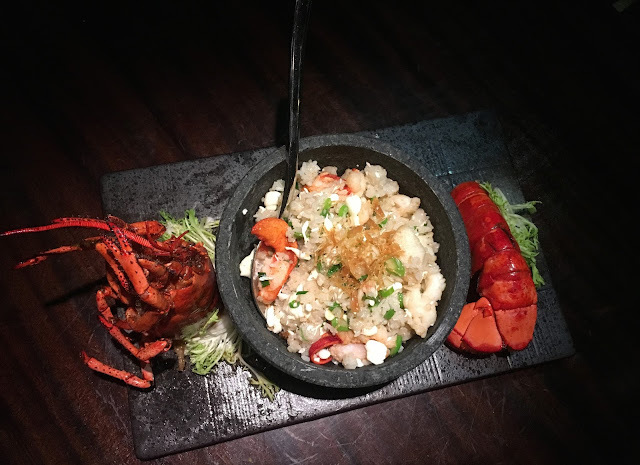 We opted for the seafood fried rice with lobster, scallops, and egg. Out of everything we had, this was our least favorite. The scallops were decent but the plentiful lobster was dry and rubbery. The rice could have benefited from additional seasoning too. While the presentation was beautiful, the execution fell flat. Last, but not least, it was time for dessert. I honestly didn't expect to love dessert as much as I did. We tried two items, and I would say you have to save room for both! The first was the salted egg bao, which are soft steamed buns filled with a sweet egg custard mixture. The warm buns are pulled apart to reveal a gooey middle that is sweet and incredibly satisfying. The second dessert is the sesame golden balls which are essentially balls filled with taro paste, and rolled in sesame seeds. The chewy texture is similar to gummy candy inside, and the sesame seeds on the outside provide a little crunch. Overall, I enjoyed my meal at Imperial Lamian. It's refreshing to have delicious Chinese food in an area not known for it. I'm officially obsessed with soup dumplings and can't wait to go back to try the other varieties. If there is one thing you must order, it's soup dumplings (and the egg bao or sesame golden buns, OK, that's three things). Word on the street is that eventually the restaurant will open for lunch and weekend dim sum brunch. They're also working on obtaining their sidewalk cafe permit so you can dim sum outside once the weather warms up! Note: my meal at Imperial Lamian was complimentary; however all opinions are my own.